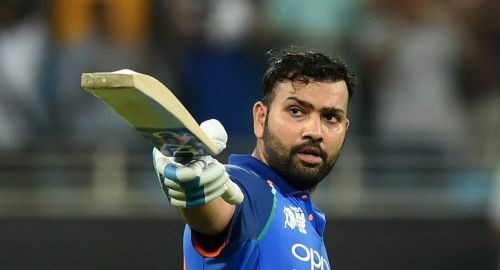 Adding yet another feather in what is an already crowded hat, Rohit Sharma became the fastest to reach 6000 runs as an opener in ODI cricket history. The Indian vice-captain played in the middle order for India in the initial stages of his ODI career. He struggled a lot in the early days. Rohit took 108 innings to score 3000 runs, which is the 85th fastest in ODI cricket. Once he started opening the innings, his career graph completely changed. He has now become the second Indian to score a double century in ODI cricket. And now, he has four ODI double centuries. It sums up the fact that Rohit as an opener has become a lethal player in world cricket. Australia is currently playing an ODI series against India. The fifth ODI between these two is being played at Delhi. Australia batted first and scored 272/9 in 50 overs. India lost Dhawan's wicket early in the chase. When Rohit Sharma crossed 13 runs, he became the fastest to reach 6000 runs as an opener. He broke the record of Hashim Amla, who took 123 innings to cross 6000 runs as an opener. Sachin Tendulkar is the third fastest with 133 innings. During this innings, the Indian opener also crossed 8000 runs in ODI cricket. He took just 200 innings to complete the landmark, which is the third fastest along with former Indian captain Sourav Ganguly. Indian captain Virat Kohli is at the top with 175 innings. This will be India's final game before the World Cup. Rohit Sharma is set to lead Mumbai Indians in the upcoming IPL before they head to England for the 2019 World Cup.